Boilerplate is an indie music mascot! 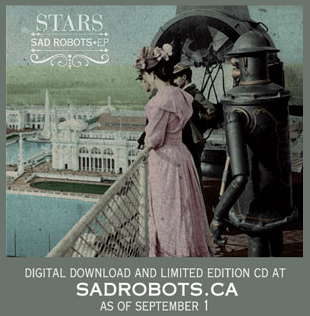 The robot appears on the cover of the latest STARS album, Sad Robots. Boilerplate images also grace various merchandise for the album and world tour. The album as advertised online. The cover sleeve features a wraparound graphic of Boilerplate at the Chicago World's Coumbian Exposition. 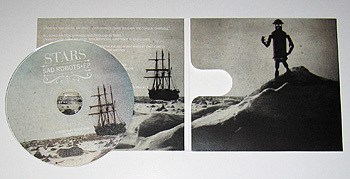 The liner graphic and disc art are from Boilerplate's Antarctic expedition. 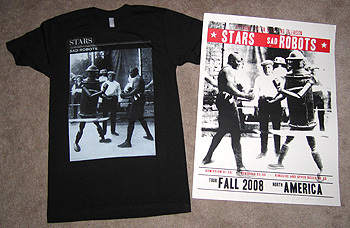 STARS ran with the image of Boilerplate sparing with Jack Johnson. 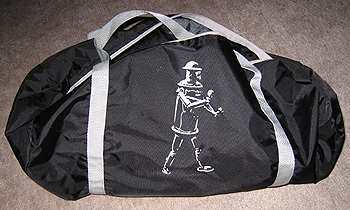 It adorns the Sad Robots tour's t-shirt, poster, and tote bag. Here's a typical news item about the album with a small collage of Boilerplate images. 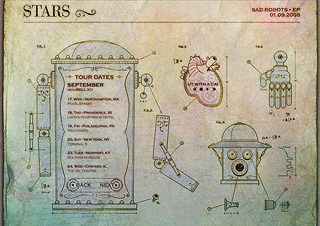 A way cool animated Boilerplate schematic is on the band's website. 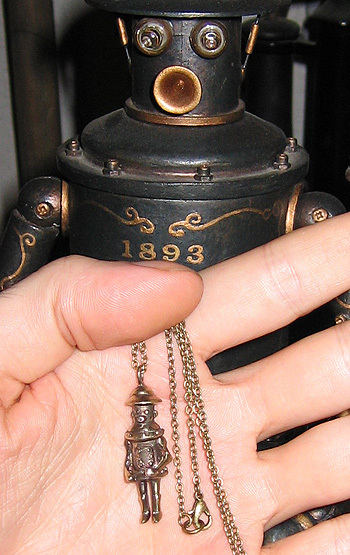 A Boilerplate pendant created as a souvenir of the Sad Robots album. 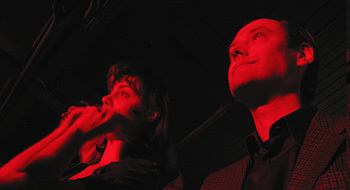 Carol and Paul enjoyed the show, then afterwards hung out with the band in their ginourmous tour bus. After a birthday toast to STARS road manager Ioan, everyone headed over to the Roseland for an exclusive after-party. Eugene Hütz and Gogol Bordello provide the music for the two dozen (or so) attendees--everybody danced! October 8, 2008, Portland, Oregon. Paul brought STARS fan Carol Main, who can recite lyrics from the album Set Yourself On Fire. 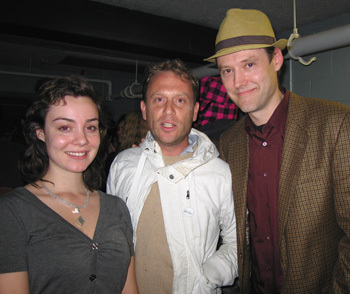 Torquil Campbell, STARS frontman, poses with Carol and Paul after the concert. While Carol cuts a rug, Shannon Stewart eyes the extensive spread of free chow--or, as he calls it, "rock cheese." 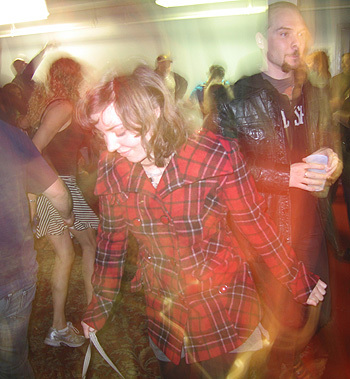 When the Roseland kicked us out after 2 a.m., Shannon took the die-hards to the Crown Room. The club had just closed, but reopened up for our impromptu rock-celeb party. 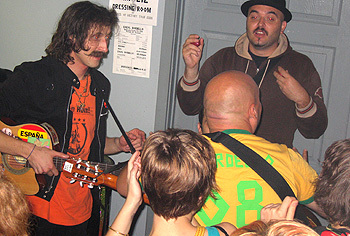 By then the crowd was down to only a dozen or so, Eugene and some Gogol Bordello people, as well as Torquil and STARS bandmates Evan Cranley and Chris Seligman. So who do rock stars think is cool? That's right, comic book artists! 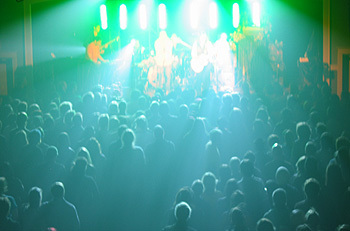 We gabbed about art and music, cabbages and kings (that's for Torq), until it was time to drive the STARS folk back to their bus to make a 5 a.m. scheduled departure for Seattle, where they were scheduled to play at the Showbox Theatre. It was one of the last stops on their North American tour. The next leg: Asia.